BIOAVAILABILITY WITH WHOLE TURMERIC POWDER. Turmeric contains compounds (such as curcumin and ar-turmerone) that never occur as an isolate in nature for good reason. Taking isolated single nutrients, as you might find in a curcumin capsule, is not a normal way to eat - the vital elements that make these compounds so beneficial are missing. 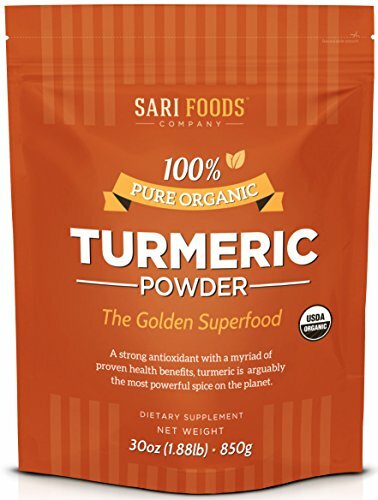 Sari Foods Organic Turmeric Powder includes the entire root with its complete and complex nutritional makeup that your body can both recognize and utilize. CHOOSE PREMIUM, ORGANIC AND RESPONSIBLY SOURCED. When it comes to what you put in your body, premium is always the best choice! In addition to its superior taste, Sari Foods sustainably sourced turmeric is organically grown under strict USDA regulations and has been harvested at its nutritional peak. SUPPORT A HEALTHY CARDIOVASCULAR SYSTEM AND BLOOD FLOW. Used in India for centuries, Turmeric is now widely recognized for its nutritional content and healing properties. Organic turmeric has many active benefits and is popular for it's ability to support the cardiovascular system which can improve circulation, coagulant and platelet ability as well as boost healthy cholesterol levels. STRENGTHEN JOINTS AND MENTAL CLARITY. Our organic turmeric works to promote optimal joint function and relieve an over sensitive immune response. Nourish your physical health naturally by supporting improved movement and flexibility whilst also encouraging optimal brain function. With antioxidant activity that provides protection from cell-damaging molecules, the ar-turmerone present in organic turmeric has been shown to promote brain health, cell regeneration and memory function. GET CREATIVE WITH A FREE TURMERIC RECIPE TASTER CARD. Looking for more ways to incorporate turmeric into your health-forward, anti-inflammatory diet? We will send along inspiring savory and sweet ideas with your purchase. Why choose whole food based and naturally occurring, organic turmeric? Whole foods have a complex nutritional makeup rich in beneficial micro and macronutrients that our bodies can more readily recognize and extract. Used in India for centuries, Turmeric is now widely recognized for its nutritional content and healing properties. This powerful superfood has been shown to help support a healthy digestive system, brain function, cardiovascular system and joint health. The most sought after compound in turmeric, and the one responsible for its vibrant color along with many of its active benefits, is curcumin. As a naturally potent spice, turmeric is also an excellent source of both iron and manganese. Sari Foods Raw Organic Turmeric is 100% pure and made from high quality hand selected turmeric rhizomes. Farmed in India, grown organically outdoors in bright sunshine, it is then hand-picked, sun-dried and gently ground in its entirety to preserve all of the precious nutrients for perfect goodness.